Installing electrical conduits underground is the best method for distributing power and low voltage to buildings, landscape lighting, motorized gates, security cameras, and intercom systems. Some of us have learned the hard way how susceptible above ground wiring can be to damage from bad weather and other outside forces. Ice accumulation, wind damage, lighting, and falling tree limbs can all cause an interruption to your power. Underground electrical conduits are protected from these and other types of damage. Above ground wiring can be an unattractive eye sore and underground conduit remedies this. JK&L Electric has experience in working with local code officials in observing proper burial depths, conductor sizes, and insulation ratings necessary for your permitted projects. 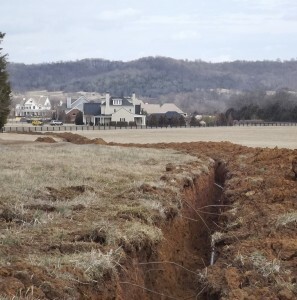 JK&L Electric also has experience working with utility services to locate existing phone, cable, water, and sewer lines, to avoid any damage during the excavation process. Your JK&L electrician can give you a clear idea of how involved your project will be, making sure all of the work will safely meet National Electric Codes and last for years to come.